Submitted by Zeroark on 2018-06-14 19:36. This package will solve issues with the Brownie and Wermic races that have been added by accident on the lastest version (v. 1.75) Also, if you see Wermics or Brownies on PCs on your 1.69 server, this can help too! THIS IS A TEMPORAL FIX UNTIL CEP TEAM FIXES IT THEMSELVES! cep265_races.hak: Add this hak at the top of all your haks, and this will resolve it. racialtypes.2da: If you already have another top hak (I.E: A hak with all your custom 2das) add this 2da to your package, and should fix it. If you already have a custom racialtypes.2da, you'll have to merge it yourself. Additionally I provide a module (CEP - Starter 265 - Fixed) which is the same module as the Starter 265, and the only difference is that I've added my fix hak on top, so you can check the fix works. Any feedback is greatly appreciated and as stated above, THIS IS ONLY A TEMPORARY FIX, WHEN CEP TEAM ISSUES AN OFFICIAL FIX, YOU CAN REMOVE THIS ONE! Am I right in thinking that this is only an issue with EE? You are correct, that's why I specified version 1.75 on this package tag. On that version, they enabled new custom races based on the "PlayerRace" flag, where on pre-1.75 the races were hardcoded to the original ones, but now they are a grid like Classes. Since CEP has Wermic and Brownie with "PlayerRace" = 1, players were able to select them now, but that only happens on 1.75 onwards. Technically this is not new issue. 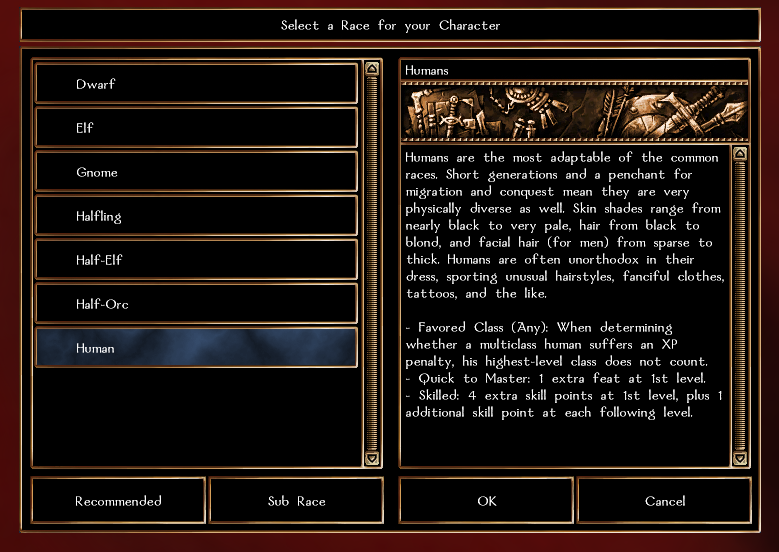 Player can use NWNCX + nwncx_patch to enter your 1.69 module/PW with Wemic/Brownie as it offers same functionality as NWN:EE - choose custom races and both wemic and brownie are set as playable races in CEP so even if you use ELC, server will not reject such character. Never got the chance to implement those on my 1.69 server, so I just noticed those use cases. But I'm glad this fix can help also older versions. I'll add it to the description, just in case someone on 1.69 still have these issues! You misunderstood. This has nothing to do with server. Player with NWNCX+nwnx_patch will be able to select those two races on any 1.69 server using CEP without thix fix no matter if the servwer uses NWNX or not. Will the players have to install this as well? Yes if you don't want Wemics & Brownies as PCs.